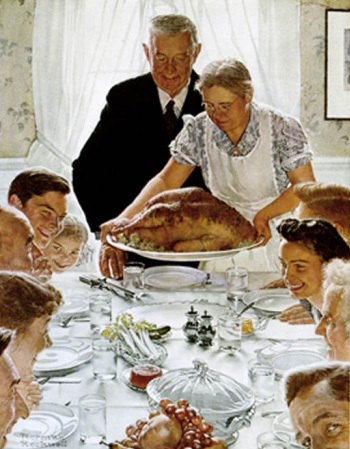 Thanksgiving is a holiday that is mostly unique to North America and is a day that we set aside to be grateful and give thanks for what we have. On that day, always the fourth Thursday in November, families all over the country will gather around the dining room table and partake of a symbolic meal that is usually comprised of the best culinary efforts one can muster. They enjoy a time of togetherness, reunion and some excellent food, and then spend the rest of the day in a turkey-induced semi-comatose state, rehashing old family stories, pulling out photograph albums, watching the football games or parades on television and just enjoying the opportunity to be together for a special day. Holidays change with each generation and traditions observed by one generation oftentimes fall by the wayside when succeeding generations come along, bringing a sense of nostalgia for a return to simpler times and values. Who observes a meal of greens and pork on New Year’s Day anymore? Independence Day is almost always referred to now as the “4th of July” and mostly gone are the great speeches and parades that used to be the norm, although fireworks still remain a huge part of it. Christmas, in just my lifetime, has been pushed to the back of the line because everyone is so afraid that they are going to offend someone by publicly observing it that it has been watered down into a “Celebration of the Holidays” where we can’t even call a Christmas Tree by its proper name. Thanksgiving, on the other hand, has pretty much remained the same traditional holiday that it has always been, with just minor updates along the way to keep it fresh. If I had to choose which holiday, Christmas or Thanksgiving, was my favorite one, it would be hard to do so because they are both uniquely different. I will say that for me, the holidays begin on Thanksgiving and end on Christmas Day, so there is a certain amount of anticipation with the former and a little bit of sadness with the latter. Isn’t the beginning of a vacation always better than the end of one? The beginning of a weekend better than the end? At least for me, the holidays both begin and end on a high note and Thanksgiving is a great way to kick off my favorite time of the year. In 1979, my widowed grandfather married a lady he had known from his younger days, both of whom had lived in the same general area of northern Georgia at some time or another. With this union, our family and her family were brought together and I was the beneficiary of several new aunts and uncles, plus six new cousins, most of which were fairly close to my brother and I in age. Thanksgiving became a lot more fun after that for many reasons. The trip up there was just far enough away to make it seem like we were going somewhere but not so far that we ended up in the “are we there yet?” mode. All the kids would find something to do together and we would play for hours and hours while the adults either watched the football games or played bridge. The neighbors would drop in and out all evening and home movies were brought out often and they got funnier as we all got older. The traditional meal would be observed around lunchtime of course but there was also Thanksgiving supper and a lot of snacking in between. One tradition that has been steadfastly observed year after year is the annual signing of the Thanksgiving page. I’m not sure which member of my extended family started the tradition but it has become a common practice that each Thanksgiving, a new, clean white sheet of paper the size of a poster is obtained and the word “Thanksgiving” plus the year is written across the top. The page is left out in a conspicuous location all day long and through the day, everyone takes a turn writing a sentence or two and signing their name to it. By the end of the day, every square inch of white is just about covered with handwritten messages, from the youngest members who can just write their name to the oldest ones and the messages cover a great variety of topics. Some express thoughts of family or what a great day it had been; others leaned towards the humorous such as inside jokes, one of which has been running for at least thirty years now about some family who came to visit and did something bad enough to draw the ire of the entire family. Over the years, the stories told about this family have grown to epic proportions and one would think they had done everything from stealing the Thanksgiving turkey to burning down the house. The pages over the years are still filled with quips and comments about this particular family. While the tradition is to write the new messages each Thanksgiving, the fun part is reading all the old Thanksgiving pages, which have been tenderly cared for and transported to the household that the event is held at each year. The older ones have darkened somewhat from age and a couple of years someone forgot to obtain a large sheet so improvisation was necessary. Reading something you wrote at age 13 is an interesting experience but realizing that your handwriting was better at 13 than it is over three decades later is a bit startling. To all my cousins, who are like bonus brothers and sisters, I am thankful that I have been blessed with so many, both by blood and by marriage, as well as a few I chose to adopt. And to my wife, I am thankful that I found you, that you said yes, that you put up with me, that you laugh at my jokes, that even when you are mad at me that you still stand up for me if you think others have not done right by me, that you are a wonderful mother who hurts just as bad as our son when he gets hurt, that you like the only things I can cook well, that you attack a problem until you solve it, that you let me deal with new car fever in my own way, that you give of yourself without expectation of a reward and that you are part of my life. And to God, I am thankful for giving me all of the above and so much more to be thankful for. Indeed, a beautiful and well-written tribute. You have much to be thankful for; thank you for sharing your gifts with your readers. Thank you! I appreciate it as always!